Our favourite country in South America, Argentina’s got it all. Buzzing cities, spectacular scenery, amazing food and great times for backpackers. Steak, red wine, Tango shows, football…these are probably some of the words which spring to mind when you think of Argentina. Whilst this is true, Argentina offers a whole lot more. Opportunities are vast! Although Argentina is a lot more expensive than Bolivia and Peru, there are certainly ways for backpackers to keep the price down. As with other South American countries there’s no fee for UK residents getting in to Argentina. You’ll get 30 / 90 days on entry, and you can stay for longer with a visa which can be extending with visa runs to other countries. More information can be found at – http://www.fco.gov.uk/en/travel-and-living-abroad/travel-advice-by-country/south-america/argentina#entryRequirements. If you’re not flying into the country, there are plenty of border crossings over land which is not surprising considering how vast the country is. Neighbouring Brazil, Bolivia and Chile, there are several main border crossings. Most backpackers use this crossing only to view Iguazu Falls from both sides and you will need to get a visa for both countries, even if you are only on planning on being in the country for one day. Villazon (Bolivia) to La Quiaca (Argentina) – You can get to the tiny border town in Bolivia by train or bus. The tiny town gets busy in the early morning hours and as soon as you step off the bus or train, you will get hounded by travel companies offering buses to take you to your next destination in Argentina. Note that buying a bus ticket in Bolivia to your destination in Argentina is more expensive than if you were to cross the border yourself (it is a 5 minute walk from the bus station) and to then book a bus ticket on the other side. I guess the extra costs pay for the “guide” who walks you the 5 minute journey to custom controls. There is an ATM at Villazon which we were told would open at 8am but it still wasn’t open by 8.30am when we were there which meant that we had to get our emergency stash of cash out and ended up paying for our tickets with a mix of Bolivianos, Argentinean pesos and US dollars. Also, beware of the bus ticket times which they sell you. They sometimes “forget” to inform you that there is a one hour time difference between the two companies so you may end up booking a bus ticket for a time which you’re too late for. This happens a lot and it’s not a major problem for the Argentinean bus companies to change your ticket when checking in. Once over the border, you’ll be in the border town of La Quiaca. Head into the main area and you’ll find the central bus station (about a 5 minute walk from passport control). Mendoza to Santiago – This is the main border crossing between the two countries. Although the border crossing can be simple enough with plenty of bus companies making the trip several times a day, it is subject to a lot of unpredictable closures in the winter months as a result of high levels of snowfall. It may be best to check the weather a week in advance if you need to cross at a certain time such as if you have a flight to catch on the other side. San Martin de los Andes to Pucon – This is another popular border crossing as both these places are popular holiday destinations. Situated in the south of the countries, the journey between the two places is relatively simple and takes around 5 hours or so. It’s slightly easier to get to Argentina than other South American countries. BA fly direct from London to Buenos Aires. There are then direct flights to most big cities in South America and in Argentina. Argentina is a huge country. Internal flights can save you time and often can be only a little more expensive than buses if bought in advance. However the buses are good, see below. Some buses can take longer than a day, where as flights will allow you to not lose a day, it all depends on how time constrained you are. Long distance rail travel in Argentina isn’t hugely popular. There are not many routes from city to city. There’s an extensive network in Buenos Aires servicing the local area and the underground. There’s also tourist lines in Salta, Cordoba and Mendoza as well as others which are more scenic day trips, rather than A to B. Possibly the best buses in the world? Food, TV, hostess, toilets, wifi, blankets, beds, wine, free coffee and bingo! But it’s not cheap in comparison to other countries. Due to the huge distances in the country travel by bus is popular which has helped to improve the facilities. Stations are huge, with good facilities, there are plenty of options of companies and the buses are modern. For backpackers, buses are the best way to get from one city to another. Compared with buses at home, the buses in Argentina are luxurious and compared with those in Bolivia, they are heaven; I am not exaggerating. Bus journeys in Argentina are similar to long-haul flights. You get hot meals, snacks, films to watch (it’s hit or miss if they’re in English or Spanish) and if you’re lucky, you may even get a chance to win a bottle of wine in a game of Bingo! With more leg space than an economy standard flight seat, I may even go as far as saying that Argentinean buses are better than long haul flights. The only downside of this experience is the price. Similar to other South American buses, ticket prices are split into semi-cama (half-bed) or cama (bed). Some Argentinean bus companies also offer full suite seats which provide little screens so it’s like you have your own room. It goes without saying that the semi-cama seats are the cheapest. Prices of a semi-cama seat for a 24 hour journey can reach as high as £90 – yeah, not cheap. Cycling is popular within cities, especially Buenos Aires. There are a few shops which rent out bikes on a daily/hourly basis for you explore the area on your own or with a group. John hired one and managed to ride to the outskirts of the city. It’s a great way to get to know the area and pass sights which otherwise you might miss. Though we don’t have personal experience of this, we met a fair few backpackers who had managed to hitchike their way round the country. What was more surprising was that they were all female. Feedback seemed positive and safe but there was always a minimum of two in the group. With the backpacker scene growing rapidly in the country, Argentina has seen more and more hostels appearing. The standard of the hostels are good and you get a real mix of party hostels and small family run hostels. Most hostels include breakfast which usually consists of sweet pastries / medialunes (sugar glazed croissants) and free Wifi. They also tend to have decent kitchens for you to use with free spices and condiments. With meal prices at restaurants averaging around £7-9 per person, most backpackers can’t afford to eat out every night so you’ll find that the kitchen areas are great spots to make some friends in the hostel. But note that some hostels don’t allow you to bring your own alcohol in to drink, especially if they have an on-site bar. If you’re planning on staying put in a place for 7 days or more, you can usually haggle the price to knock off 10-20% if you pay upfront. Dorm rooms average around £7-10 per person. In the big cities in Argentina another option would be to rent an apartment. This is a great idea if your planning on staying more than a few days in one location or if there’s a few of you together. It could work out cheaper than staying in a hostel and almost definately cheaper than a hotel. Looking at Buenos Aires vacation rentals there’s a selection of around 1,350 apartments, which is a good selection for an up and coming city. There’s some really nice places in San Telmo and Palermo both near to the city and cool places to stay. Steak – It’s almost a crime if you come to Argentina and not go for a steak dinner (Vegetarians are the exception I guess). One restaurant which I fully recommend in the country’s capital Buenos Aires is Don Ernesto. 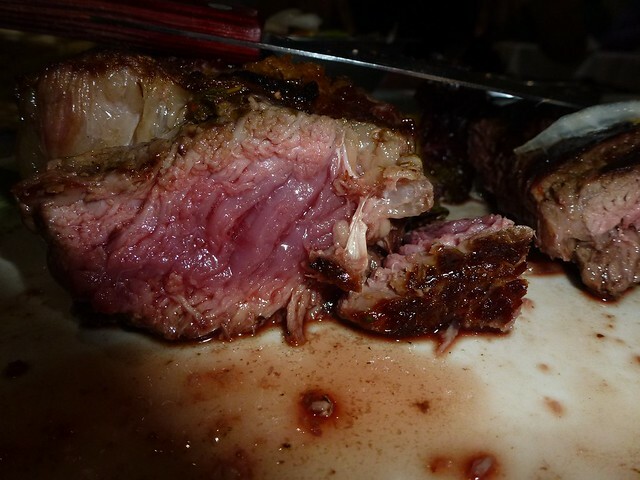 I think I ate the best steak of my life there. Choripan – Otherwise known as a glorified sausage sandwich. But because they call it choripan, you don’t feel so dirty eating one. In addition to a grilled / BBQ chorizo sausage sandwiched in bread, you’ll get tomatoes, guacamole and the famous chimichurri sauce on top of the chorizo sausage. Empanadas – A great street snack and filled with various meat, cheese and vegetables but mostly meat. Chimichurri sauce – This sauce is served with practically everything. It goes great with steak and even just as a dipping sauce for bread. Argentineans love marinading meat in the sauce prior to sizzling them on an asado (BBQ). It’s green in colour and is made from a combination of herbs and garlic. Parilla – This is basically a 100% meat BBQ usually served for a minimum of two persons. Typically, the parilla consists of sausages, black pudding (morchilla), steak, chicken and intestines. Red wine – This is an obvious one and wine tours are a must if you are in the country. The most popular place being Mendoza where you can hire bicycles to visit vineyards in the region. Quilmes – This is the national beer and comes mostly in litre bottles for about a pound. Fernet – Although the roots of this drink aren’t from Argentina, it is commonly drunk among locals and is usually mixed with Coca cola. Bottles of this stuff vary from a few pounds to up to £50. Puerto Iguazu – The most famous waterfalls in South America. 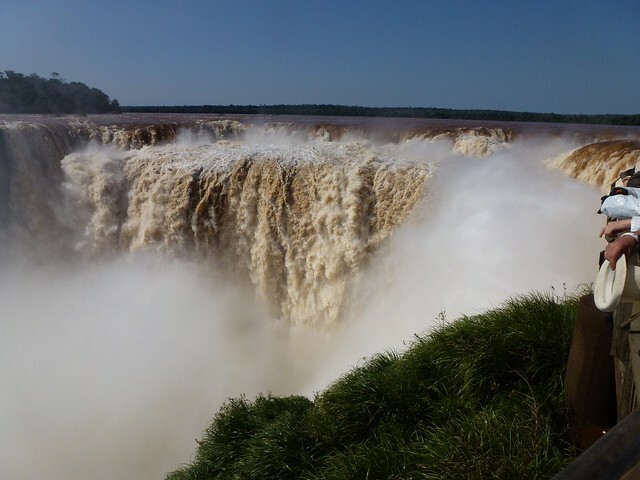 Situated in the north-east of the country, the falls can be viewed from the Argentinean and Brazilian side at the Iguazu National Park. Note that there are two price tiers, one for locals and the more expensive pricing for gringos. Boca Stadium – Football is one of the Argetnineans’ biggest passion with Boca Juniors being their most famous team. If you’re in Buenos Aires during the season, it might well be worth trying to get tickets to a match. You can also go for a tour around the stadium. Wine tour on bikes in Mendoza – This makes for a great day trip but be prepared to drink more red wine than you can ever imagine. If you hire bikes from Mr Hugo, you also get an unlimited supply of wine served in tumblers. Whale watching in Ushuia – Although I didn’t get round to do this, this is one of the highlights of many backpackers’ trip in South America. If you can get down to Patagonia (it won’t be cheap) then its a must do. Learning Spanish – Argentina offers many Spanish courses. The one which I went to was in Buenos Aires called ExSpanish. They offer various courses including a one week intensive course which I did. Snowsports in Bariloche – With amazing scenery, this ski resort is a great place to get on the slopes. But if a little pricey, hop on the bus to the small town of El Bolson where a ski pass is about a third of the price at Bariloche but the resort is not as impressive. Experience an asado done by a true Argentinean – An asado is a BBQ. It is a very sociable way of eating and as ever, there is always a lot of meat! One Response to "Backpacking Guide to Argentina"